Marie Koltchak found riding her bike helped her through one of the more difficult period of her life. When I found myself caught in the storm of my divorce, a profound shifting of my life as I thought I understood it, I sometimes crossed into periods of extreme frustration (code for anger, code for fear). Luckily, exercise, biking in my case, provided a refuge – a coping mechanism to vent deep disappointment and aggravation. I didn’t know what to do with the amplitude of feelings that sometimes threatened to run the show. From time to time, I thought I might rise up, 50 stories tall, with flames lapping at the air instead of hair, channeling Godzilla. During stressful times, physical activity can help people cope with stress and anxiety, manage moods and fight depression. Experts describe changes in vasodilation and blood pressure, with electro-chemical activity lighting up magnetic brain imaging. Exercise battles diabetes and dementia, or at least, for the latter, research points to bettering the odds. Many forms of physical activity – swimming, running, boxing (to name a few) – help release neurotransmitters called endorphins, sometimes called the ‘runner’s high.’ I think almost any form of movement or exercise will increase a sense of health and well-being. Whatever it is that helps, it’s important to find something you love to do, and stay with it, through thick and thin. “When I went through my divorce,” a friend confided, “I rode my bike all the time, like the Wicked Witch of the West.” She hummed the tune from “The Twilight Zone” (although she meant the music accompanying Miss Almira Gulch in “The Wizard of Oz,” as she pedaled, cackled and flew into the tornado). I churned up hills, muscles engaged in fierce collaboration to get the mother lode up and over summits. One day, muttering, cussing and pedaling up a hill from the ferry dock on the north end of Vashon, I crested, pretty as you please, not noticing the hill at all, as if pushed by helpful forces. Exercise, it dawned on me, rather than representing a chore on an ever-expanding do-list, offered a safe place to burn considerable energy, making way for moments to make sense of the tectonic shifts taking place in our lives. It helped me find instants of calm and optimism, amidst the whirl of alarmed cogitation in my seemingly unrecognizable new life. We made it to the other side, my Wasband and I, we chose to exit our marriage carefully, vigilant to transform the configuration of our family as gently as possible. That we no longer worked well as a couple did not erase our many years together. I wanted to honor what we had accomplished. I deployed additional strategies, along with roiling bike rides, to steady myself. And while not a panacea, I’m pretty sure that no matter what form of physical activity I might have chosen, exercise helped me seize brief moments of peace, and plant a sense of perspective and a little control back into my days. Marie Koltchak grew up in New York and lives on Vashon Island. She works for The Seattle Times as a resale and permissions specialist. 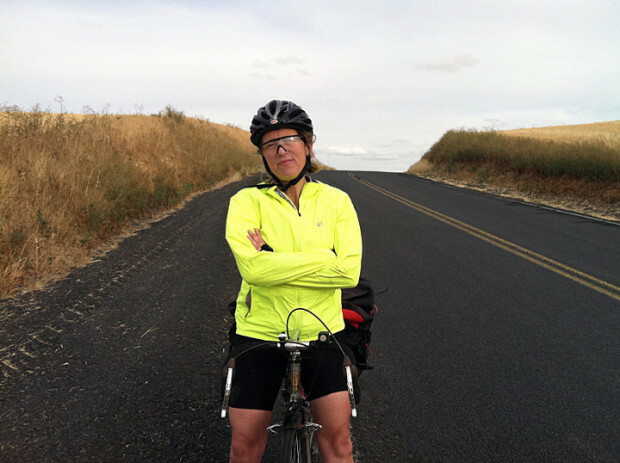 She loves riding her bike and eating chocolate, but distrusts snakes and speeding traffic.